Catching Up: Small Henges and Some News–Welcome, Blokes and Sheilas! We have gotten ourselves into a bit of a pickle (hmmm….have we ever posted a picklehenge?). We have let things go for so long that we have enough henges and henging news to fill five or more posts, even with multiple henges per post. We were going to blame it on the interns, who are always messaging away on the expensive smart phones their parents bought them, but as long as we are making people up, why not blame it on our evil nemesis, who hates Stonehenge replicas and wants to end Clonehenge forever. Yeah, that’s it–we TRY to post but he foils us at every turn! But apparently we have vanquished him, because here we are at long last! The mini-Stonehenge above was created by Kyle van Oldeniel, who lives on the west coast of Scotland. He has created this and a number of other exquisite little henges, like small art works expressing his longing for the mystery, timelessness, and connection to the earth that Stonehenge represents. He has posted more in the Henge Collective group on Facebook. Too nice for our blog, actually! Thank you, Mr. van Oldeniel–well done. The picture above was posted to the Clonehenge group on Facebook by none other than friend of the blog Simon Burrow. It reminds us a little of the clothes henge created by Markus Georg. This may not look like much, but it is undeniably eccentric in conception and unique in the henging world for its casual laundry-pile styling and variations in colour and patterns. We do not recall seeing striped or flowered stones in a henge before! What it lacks in accuracy it makes up for in, well, in… thingy! Well done! Ish. And as long as we are looking at henges made of things we wear, here is Flip-flop Henge as created and posted by Liz Smith Yeats on the Clonehenge Facebook group, where there is much more up-to-date henging news and pictures than you’ll find on the blog, with the advantage of not having to read our dreadful don’t-you-think-we’re-funny commentary! It’s not that we’re desperate to have you join the group, it’s just that if you are actually interested in henging and hengers, you can keep up despite our troubles with our intern/nemesis/broken hands/dial-up/IE6, pet dragons, etc. Indeed, Ms. Yeats, we find it worthy! And creating a Stonehenge replica out of dodgy footwear is solidly in the spirit of Clonehenge! We have many more small henges to post when our interns stop messaging their friends and annihilate our nemesis! And download Chrome. And start taking the dragons out for their daily rides so they’re too tired to keep us from posting. Etcetera. And there are at least two temporary large henges to post: that Basshenge from Burning Man that we posted about in its planning stages, and the Henge Collective’s wood henge from the Audio Soup festival. Also, there continues to be news: links to Clonehenge have been posted on the website of Current Archaeology Magazine (for a while) as well as our being mentioned in a radio show to be broadcast in Australia on Sunday, 9 September. We learned that the decision has been made, sadly, to film parts of Thor: the Dark World at Stonehenge instead of building one. We would have liked to see what they came up with! And we learned that in Roman Polanski’s movie Tess, a replica was used instead of the real thing! We have no pictures yet, but the interns are working on it! If you live in Oz and this is your first look at Clonehenge, we have one word for you: Esperance! One of the finest recent additions to the world of Stonehenge replicas. You can be proud. This post has exceeded recommended dosages, so, until next time, mates, happy henging! Latest news on the Esperance, Australia Stonehenge replica including a video with the Beales discussing it can be seen here. In the video, Jillian Beale, one of the builder/proprietors, says that some visitors had recently been to Stonehenge in England and “said it was a pile of old rocks. They’d paid seventeen pounds and it was rubbish. And in my book he’s written ‘It’s brilliant. Better than the original!’ ” Worth a watch. Meanwhile we’re still fretting over whether lintels will ever appear on the outer circle. The “Better Than Stonehenge” Henge: Esperance’s Replica Rises at Last! Was ever an erection so eagerly awaited? Well, yes, probably, but still we have been watching these stones since almost before they were cut, so it is delightful to see them standing at last! 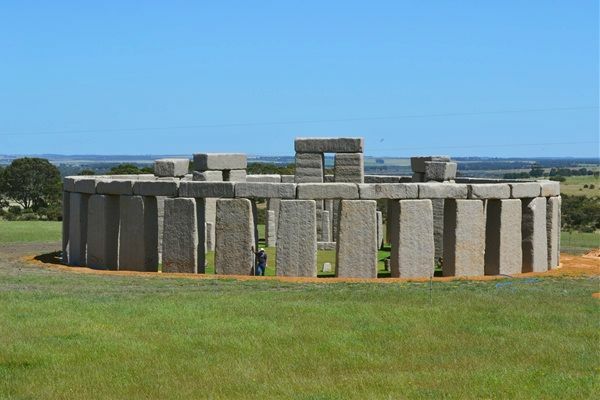 This is the Stonehenge replica in Esperance Australia, made from the stones cut for the much ballyhooed Ross Smith replica that died, so to speak, in utero with the stones still in the quarry because of money problems. We could do a whole post just on that, discussing the merits of the spelling of StoneHengeEsperance, whether this is in fact “the world’s first full-size stone replica of Stonehenge” and just how likely it is that the new structure is more beautiful than and will beat the real Stonehenge “hands down”, but time and news have moved on and so must we. We trust that our readers are of the sort who can make up their own witty remarks in a pinch. Let’s start with a discussion of whether this is the world’s only life-sized replica. No*. Then we go on to the phrase “ancient Stonehenge Druid ruins”. And when we are done LOLing we ask where did they do their research–on a forum for people who always dress in Renaissance Faire clothing? Someone needs to send a strikeforce into that sentence to take out the word Druid. Regular readers know, but we repeat: druids could not have built Stonehenge. They didn’t even arrive (or develop) in England until 1000 years after it was completed. And, for the conspiracy theorists, is there any hidden meaning in that 1066 number?? We have tried to read the rest of the article but can only conclude that the reporter misinterpreted her own notes when she wrote it. There is talk of “horseshoe stones” and “an outer circle of 19 trilithon stones, surrounded by a circle of 30 sarsen stones”. The right words are there but it doesn’t sound as if they are in the correct order. All in all, what we see in the top picture looks very good, although the lack of lintels on what we can see of the outside circle naturally concerns us. Despite the strange reporting it is getting, we think the replica (we can’t bring ourselves to call it StoneHengeEsperance) will be awarded quite a few druids (our tongue-in-cheek scoring units) once we get a complete account and view of it. We’ll try to keep you posted, but if you see something about it before we do, please let us know. Meanwhile it is time we add it to the list of large permanent replicas. Our thanks for alerting us again go to the lovely and talented @salisbury_matt , aka Matt Penny, who is still slogging away at SalisburyandStonehenge.net. Poor lad. And thanks to you if you have read all this way, or even just skipped down here from the beginning. Until next time, happy henging! * Life-sized replicas other than the Montana replica linked above include the cement replica in Washington State, the Circle of Life in Connecticut (of granite as this one is), and the BBC’s Foamhenge, which, alas, no longer stands.